We didn't show an Eko guitar here for ages - here is a Manta in very good condition for 40-year old guitar. It's one of the models that have been reissued by the reborn Eko company lately - I must say I prefer the original pickups (probably just my chrome fetish). The bridge couldn't be simpler, I wonder how the intonation is on this guitar! This guitar's patented revolutionary unique design joins the end of the neck to the body creating an all around brace removing the need for a truss rod. 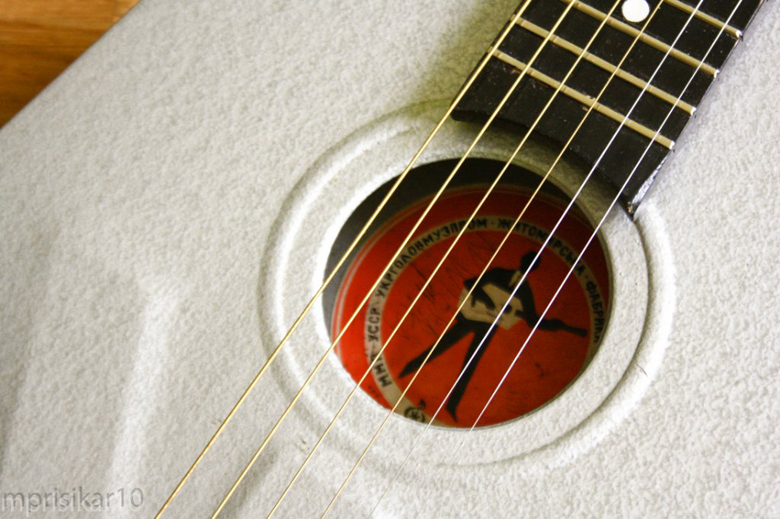 The three sound holes in the top side create a better listening perspective for the player. The round hole and F hole help to distribute the tones equally along the front of the instrument. I guess that volume-wise (I'm talking litres rather than decibels) the body is of similar size - although a very different shape - to that of a regular classical guitar. The video below gives a good indication of how good it sounds/. The Cupit travel guitar has a list price of $499.99, but according to the website it appears to currently have a sale price of $349.99. Just one last comment: that name "Cupit"... judging by the logo it looks as if someone couldn't spell "Cupid". 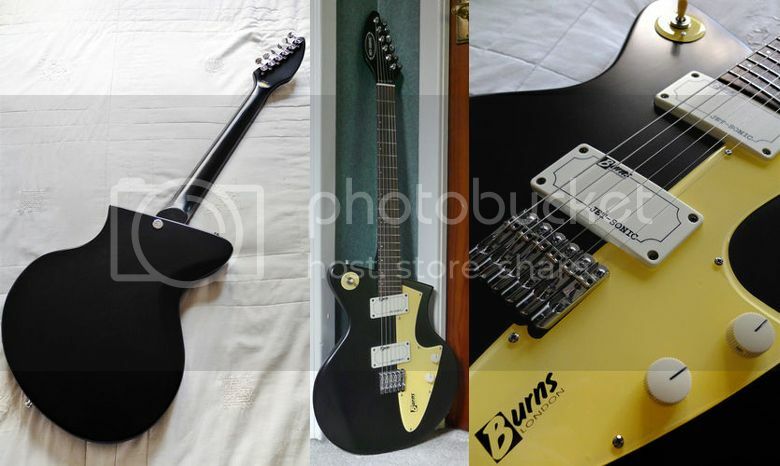 I know because I have one of each from Washburn, with documentation. 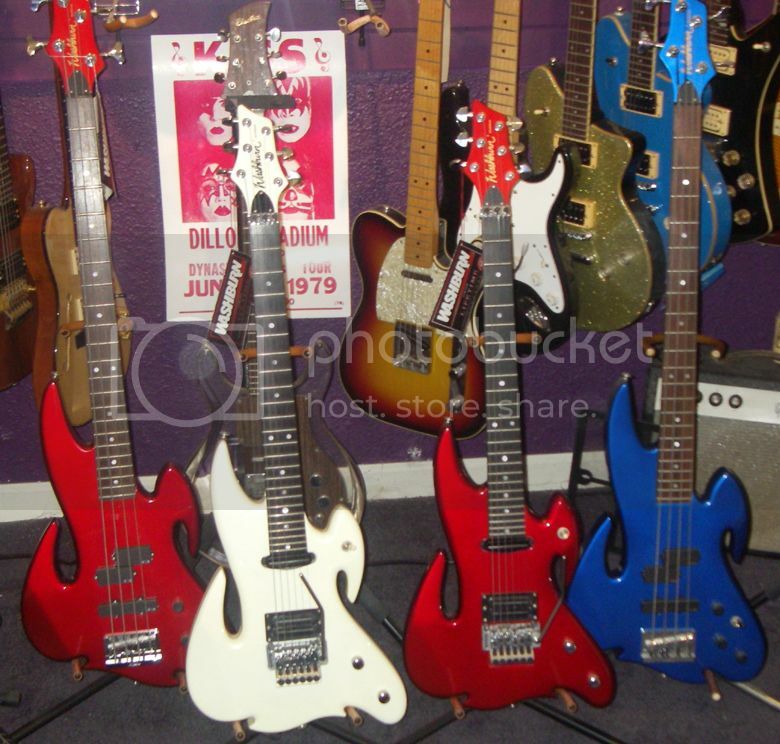 What I was told when I bought these guitars [was] that Washburn gave one of each guitar to Nuno, and One of each bass to Chris Squire of Yes. 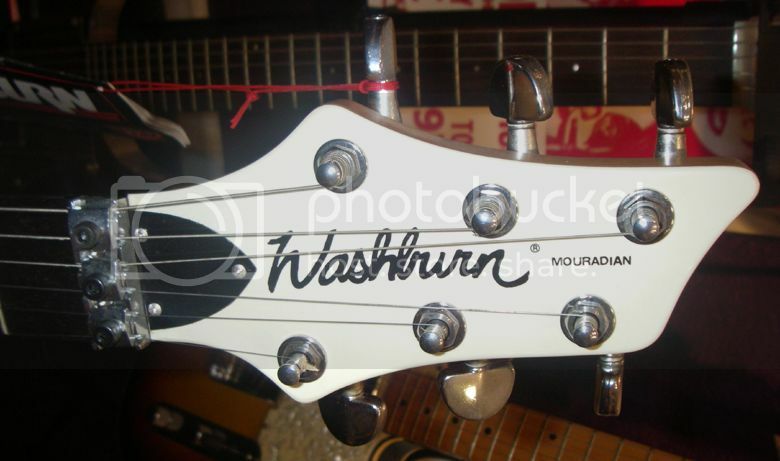 Kev was also kind enough to supply us with the photos reproduced here of his Mouradian guitars, indeed what must be the largest collection of Washburn Mouradians. When I say "Modern" I don't mean that this guitar is an uptodate contemporary instrument, but rather it is actually a vintage 1960s Italian-made guitar badged with the "Modern" brandname. Of course, Italian guitars of this era are famed for being festooned with pickups and switches, and this Crucianelli-made guitar doesn't let the side down and features three pickups with a volume and tone control for each, plus pickup selector switch and individual switches for each pickup. Whether these are simple on/off switches or whether they do something cleverer with the tone (I doubt they are coil taps as the pickups appear to be single coils) I couldn't tell you. 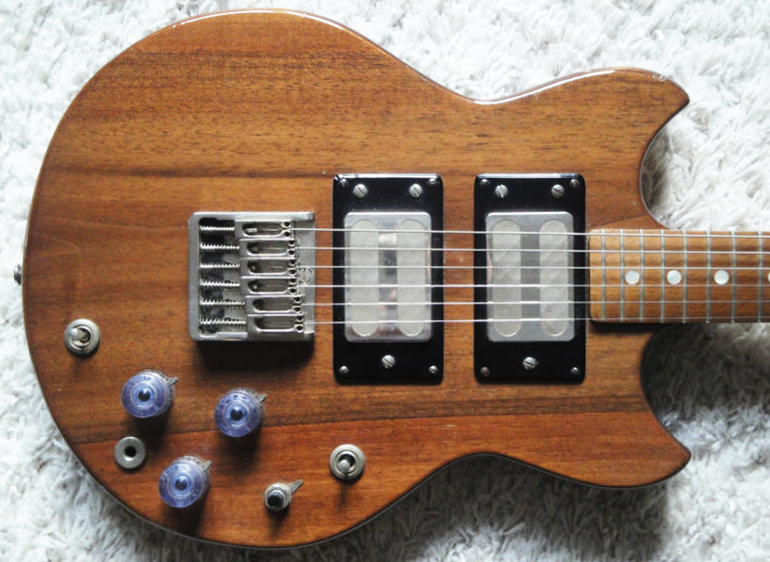 And perhaps all those volume and tones were just too confusing for a previous owner, as the seller of this guitar tells us that "The Vol/Tone knobs appear to have been wired in a line so they all act as master vol or tone knobs instead of individually." It's a great looking guitar - I personally don't care for the pearloid plate for the three switches on the upper horn which gives the guitar the appearance of having a band aid or three slapped onto it - but I guess it's idiosyncratic features such as this that make these vintage Italian guitars so appealing to collectors. Currently being offered for sale on eBay with a Buy It Now price of $639.95. 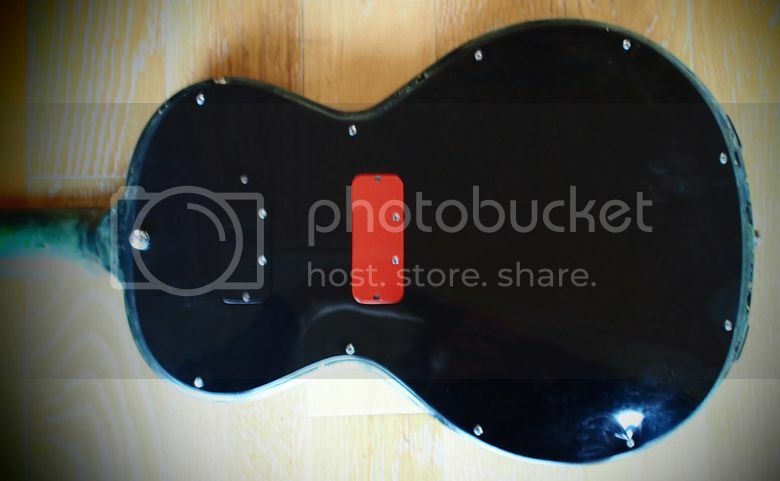 what is this Plasma-labeled guitar? This Plasma guitar feels like a one-off - and if not it's been anyway retrofit because you wouldn't find a wooden pickguard on any factory guitar! Or maybe it is a Frankenstein, because neck and headstock are typically 1970s Japanese cheapo... But I don't remember ever seen such pickups and bridge (and the knobs could come from a toaster or something). Any idea? Labels: Czechoslovakian guitar, Jolana, vintage guitars, What's that guitar? This beautiful and quasi-mint Supro Arlington S655 may have a a classic (though inevitably elegant) Jaguar-style body - being not as radical as some other Supros and neighbour brands (it's a vast topic) - but it has two Supro characteristics that make it cool and rare: a fiberglass body (aka Res-O-Glass) and a piezo pickup under the bridge that make it sound like no other guitar. This makes it not only a collector's treasure but also a desirably playable instrument! And of course you cannot not love the big faux-tortoise pickguard and the six rectangle switch in line - the guy who will buy this guitar will be a lucky fellow indeed! Surely this Goldklang archtop is a relation of other German brands Musima, Migma and Perlgold guitars? There are too many design and hardware similarities for it to be mere coincidence. It's a fantastic looking guitar and don't you just love the name Goldklang? 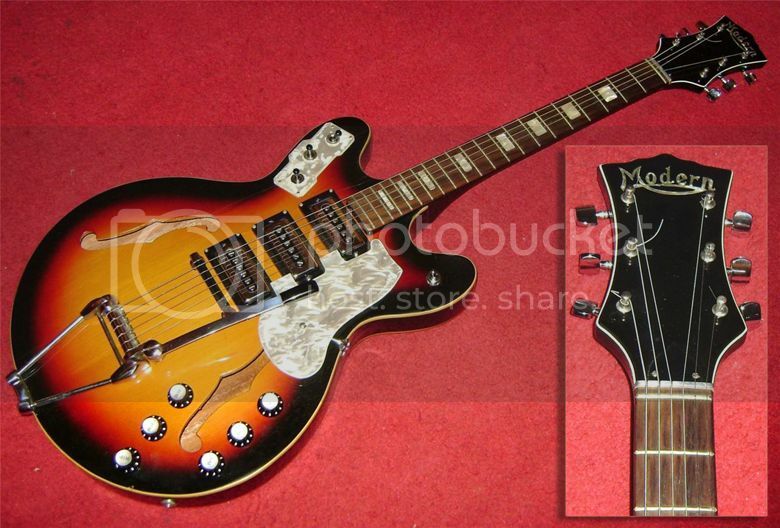 This guitar is being sold by a seller in Poland and the eBay Buy It Now price works out at approximately £484 / $764. The Jet Sonic is a post-Jim Burns design, courtesy of Italian designed Pagelli. At first glance it looks like someone has taken a saw to a Les Paul but a closer inspection reveals some tasty curves and contours, and the gently curving upside-down 6 in-a-line head complements its weird good looks. Otherwise the layout is pretty standard fare, with two Burns split-coil humbuckers (albeit in parallelogram-shaped casings), single volume and tone and 3-way selector switch. The above-pictured example is currently being offered for sale on eBay UK with a Buy It Now price of £549. I'm always on the lookout for interesting guitars and basses for our left-handed friends, and reckon that this 1987 Kramer Ferrington acoustic bass isn't something that you see every day, let alone find as a left-handed model. 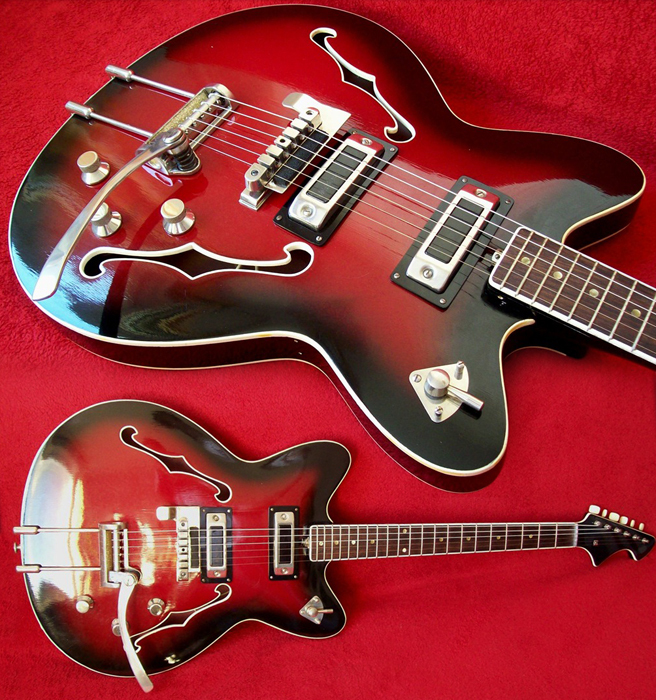 These "electric-shaped" double-cutaway acoustics were designed by Nashville luthier Danny Ferrington, who in the early 1980s had been creating similar one-off designs for himself and a whole bunch of celebrities, before his designs were snapped up and put into mass production by Kramer thus giving Ferrington his 15 minutes of fame. 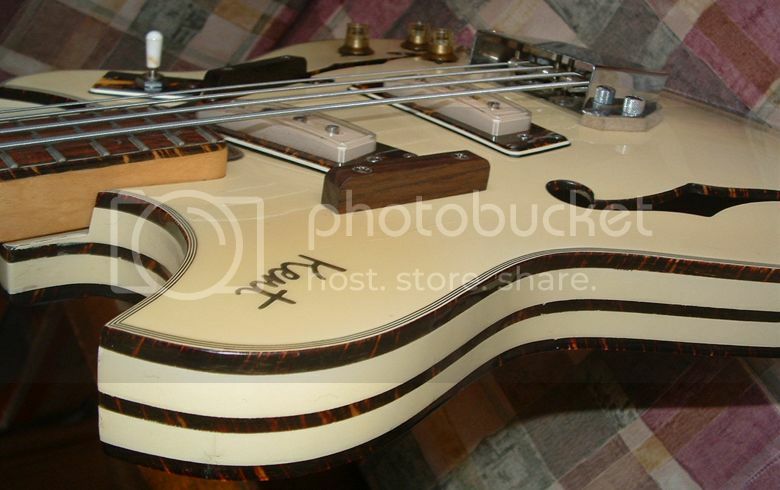 Well, I say "mass production" but according to our eBay seller here, this left-handed example of a Kramer Ferrington Bass is one of only two known to have been made. It is currently being auctioned sale on eBay with a very low starting price - it'll be interesting to see what it fetches when the auction finishes on the 27th of this month. Czechoslovakian company Jolana released several beautiful semi-hollow body guitar models with the same outline than this Jolana Graziella, all with the same elegance and attention to details. The Graziella has this cool selector you usually find on Diamond models, and a muting system mounted on the bridge. I love the trem-tail and the F-hole binding - and the trademark headstock shape. 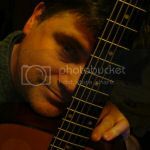 I'd like to share with your readers one original guitar I recently put my hands on. It may be a Matsumoku or a Kasuga one, made in Japan, it was bought in France circa 1977 (according to the previous owner). 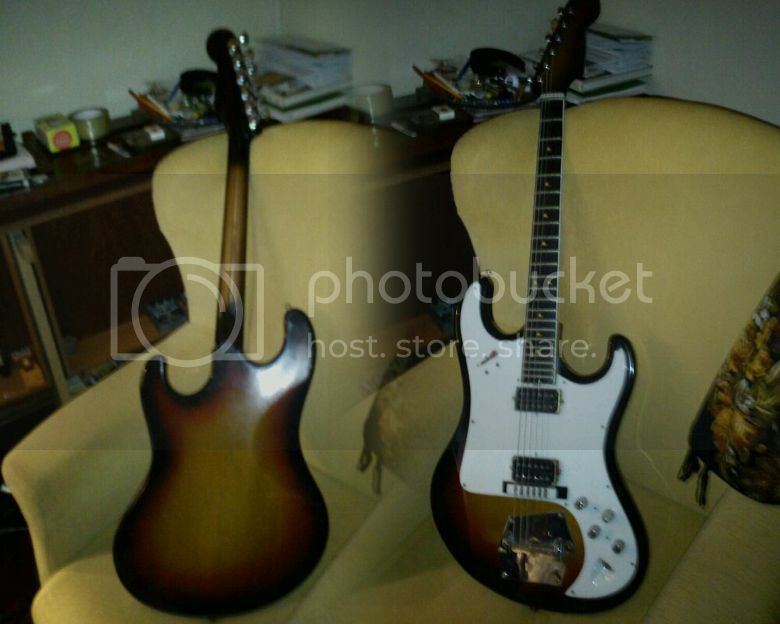 The shape of the body is quite original and after few weeks lurking at vintage guitars catalogues and internet forums, I still can't clearly identify it. Pickups are TWB-20, a Japanese copy of DiMarzio Super Distortion. The overall quality build is very nice, excepted for the original bridge that I replaced with a new one. 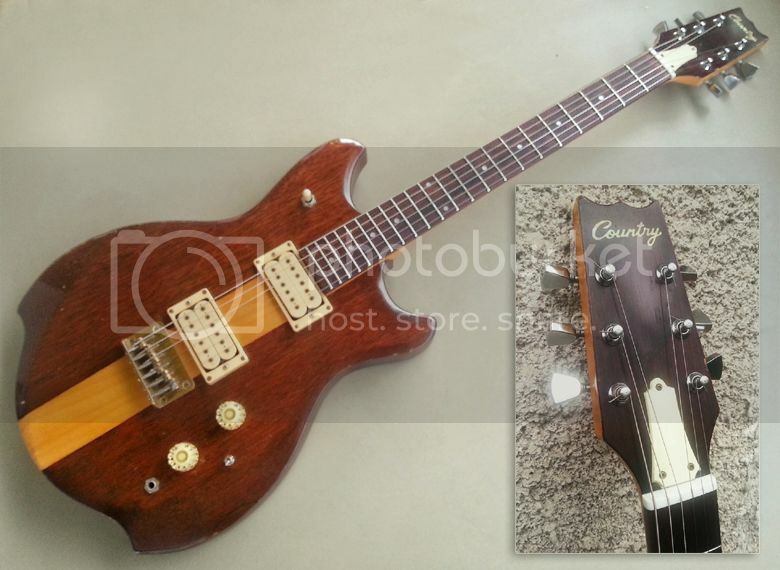 I would compare it to some great examples of Matsumoku made guitars (this bridge is found in some early models of Electra brand guitars... made by Matsumoku). While cleaning the guitar, I noticed the note "SV300" on the heel of the neck, may it be an indication of the model? According to my local guitar maker, woods are: mahogany for the body (or is it bubinga?) with a piece of maple for the centre part, one piece of maple for the neck and rosewood for the touchboard. 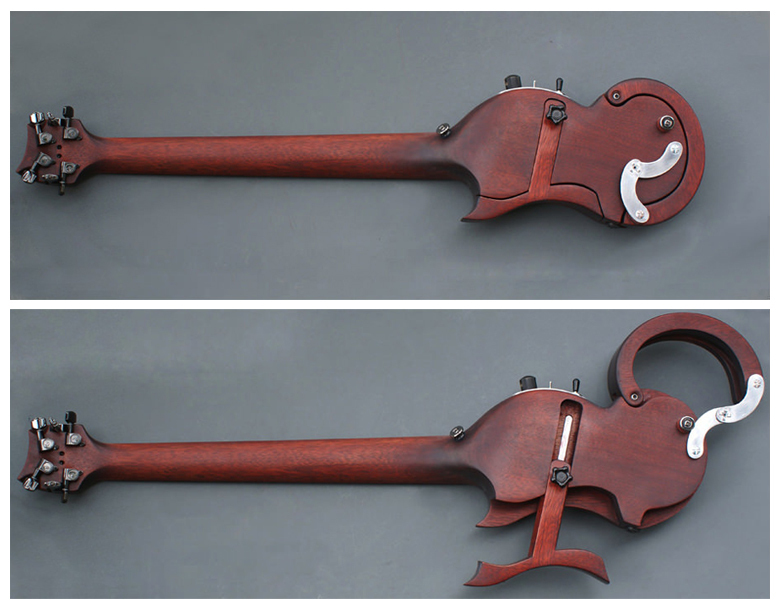 Would it be an early example of Matsumoku original design guitar? Or could it be a Kasuga Musical Instrument guitar, a factory that made guitars for some well known japanese brands like Greco or Tokai? I'd like to have the inputs of your contributors and readers about this one, even better: an actual pic of the same guitar from some old catalogue! 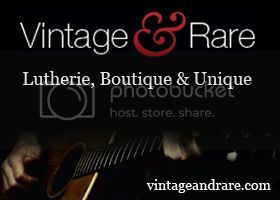 You'll find lots of pics of the guitar on my website (article in French). Thanks Greg. It's not a model I am aware of, and neither have I previously heard of the "Country" brand. 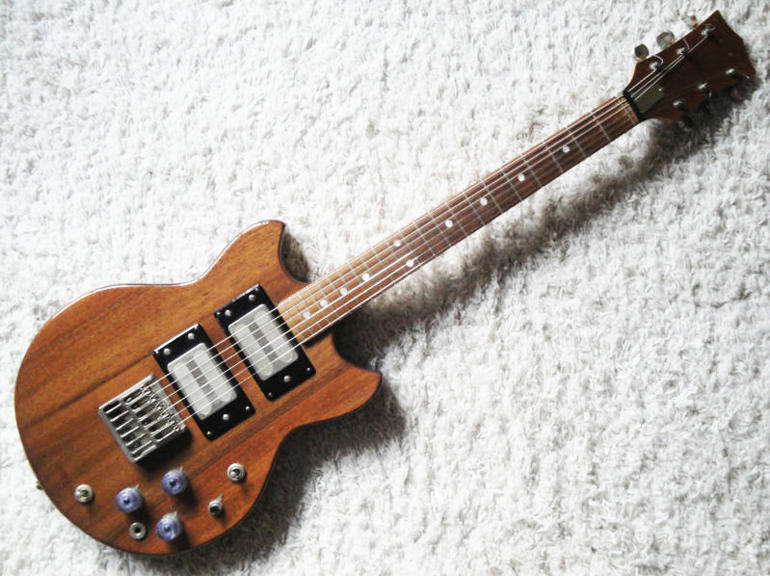 Whilst it does seem plausible that it could be a Matsumoku guitar - they were quite fond of sandwiching the different body timbers in the style shown - I wouldn't rule out the other Japanese manufacturers either. If anyone has any more info, please let us know via the comments below! Thanks! Firstly I'd just like to say I've done some serious detective work to bring this post to you. I saw this funky and rather spiffing Zhitomir guitar a couple weeks back but I wanted to find out a little more information than the seller gave. 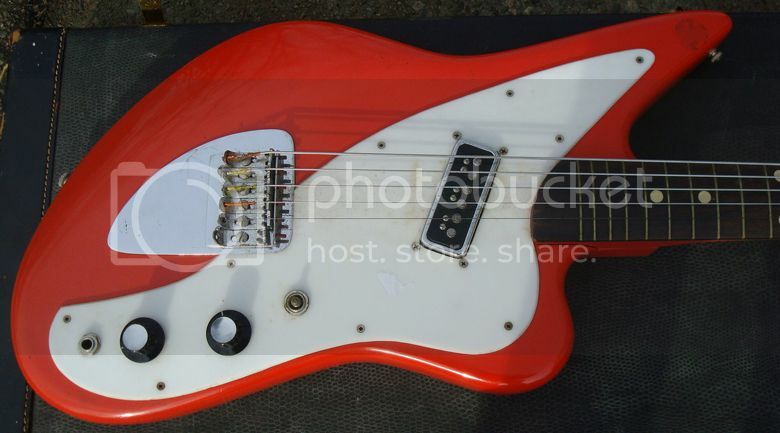 Check out this hot piece of Soviet history (cheesyguitars actually said Soviet junk). The date of its introduction in mass production is unknown, but I it must be somewhen around 1970s (1980s according to CG but I guess sometimes Ebay-speak can be a little like estate agent speak). It was produced in very small quantity, so you won't find this guitar again (Ebay-speak). The body sports an extremely intriguing octagonal shape with a giant Russian letter "Ж" (Zh) embossed on it, which must remind the proud owner of this deadly weapon the name of its manufacturer - Zhitomir Factory of Musical Instruments. The label inside has a picture of some cool guy dressed in black suit - perhaps a Beatle - playing this guitar. The best thing about "Zh" is the material of its body. It's aluminium (!!!) 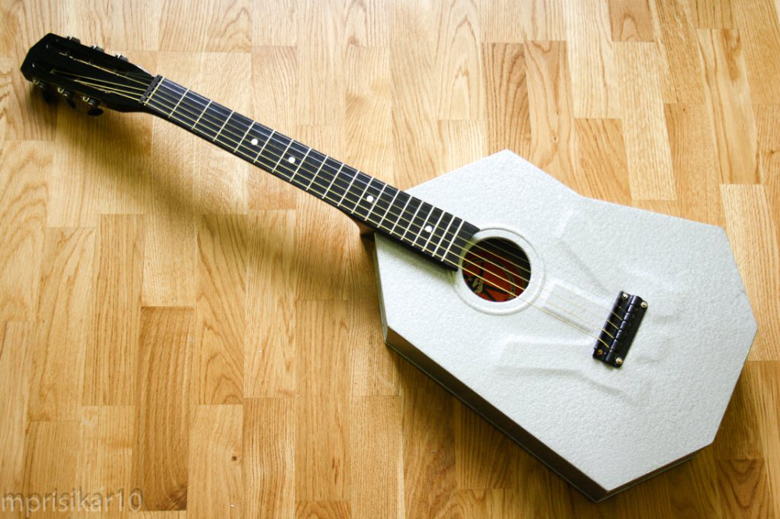 (Ebay exclamations), just a thick sheet of painted aluminium folded in shape of... well... guitar. What kind of evil mind could put forward an idea to produce guitar from aluminium in one of the most forested regions of Ukraine? I think it's perfectly suit (CG spelling mistake copied by Ebayer) for true Norvegian black metal musicians (or as a present for vintage rare collector), because the sonic palette is really uncompromisingly evil, to say nothing of this instrument's looks. The guitar is on Ebay with a $1,099 price tag and it's already garnered four offers, so if this is your bag, get on over there and tussle with the other hopefuls for it. Not a great photo, I know, but it does go some way to illustrate the Über Kool label inside. 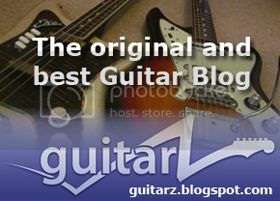 There is a little more on CG but it doesn't apply to this particular instrument although it does show that the guitar on sale is not the one played by Vopli Vidopliassova, the popular Ukrainian rock band, in their 1989 hit "Юра". For the eagle eyed, there is clue in the instrument itself (the one in the video) or you find out on CG but that would be cheating. (clue: the neck). Not surprisingly, being from The Ukraine, they play some other interesting Ukrainian guitars in one of their other videos such as this enigmatic performance from 1989. CHECK OUT those guitars! A Youtube search for them in their Ukranian name Вопли Видоплясова will lead to a veritable treasure chest of their other videos. Well worth the watching and not just for the guitars. PS. 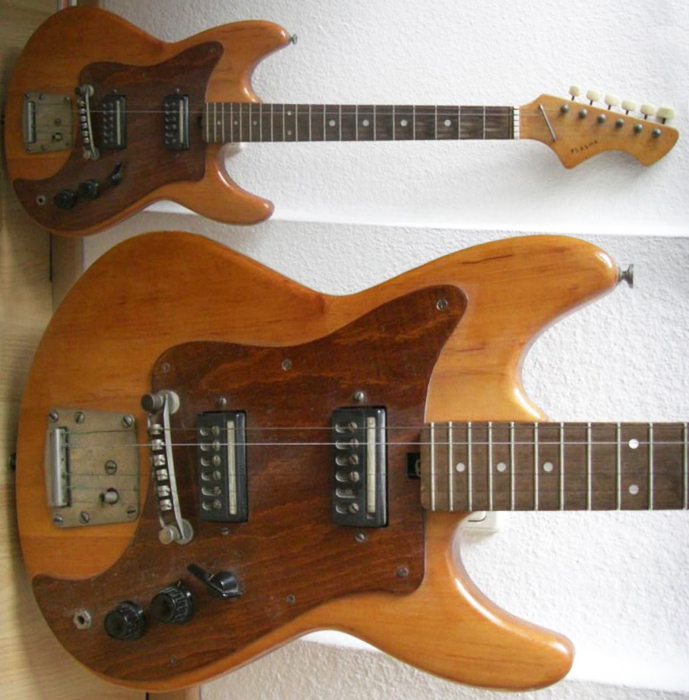 Anyone interested in crazy vintage Eastern Bloc guitars (and who isn't?) could do worse than spend a little time perusing the archives over at CheesyGee. At first glance you'd be forgiven for asking "Are there enough controls on that single pickup guitar?" However, of course, the Kramer Ripley is not a single pickup guitar as such, rather it is equipped with a Bartolini hex pickup which essentially consists of individual pickups for each of the six strings. The guitar features a stereo output and individual panning controls allowing each string to be assigned its own position within the stereo spectrum. This particular example is one of only three made that includes an on-board "Hex" distortion allowing levels to be individually set for each string, and it is also the same guitar that appeared on tracks on Mick Jagger's Primitive Cool album from 1987. 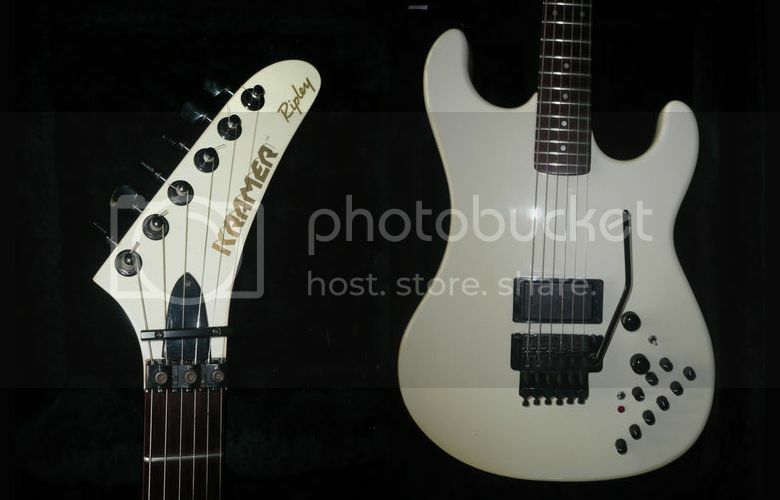 Eddie Van Halen is also known to have played a similar Kramer Ripley guitar, and its stereo effects can clearly be heard on the song "Top Jimmy" from Van Halen's 1984 album. This particular guitar - which has been played by Dave Stewart (Eurythmics), Jeff Beck and Mick Jagger - is currently being offered for sale on eBay UK with a Buy It Now price of £1,800. I'm afraid I know nothing about this Oscar Schmidt Stella Sovereign violin-shaped acoustic guitar, but I think the design is rather gorgeous. It's interesting that, despite being styled after a violin, the guitar appears to be a flat-top rather than the archtop you'd expect. This guitar is thought to be from the 1920s which makes it very nearly antique. It's in original condition and includes the original rope strap, although unfortunately the seller reports that the top has sunk a little beneath the bridge. Although the name "Dobro" is often applied generically to resonator guitars, the name should of course more accurately only be used when referring to specific resonator instruments bearing the Dobro brandname (the trademark currently being owned by Gibson Guitar Corporation). The name "Dobro" originated in 1928 when the the Dobro Manufacturing Company was formed by the Dopyera brothers, being a contraction of "Dopyera brothers" and, conveniently, also meaning "goodness" in the brothers' native Slovak tongue. 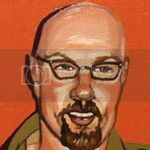 The history of the resonator guitar, the Dobro, National and Regal brands is all quite complicated and convoluted, but if you'd like to know more there are plenty of sources elsewhere on the web and in print. John Dopyera [..] claims to have built nine of these guitars with the "Penetro" label on the headstock before they were licensed to "Regal" to market under that name. So this appears to be one of the nine Penetros, and it may well be the last one on the planet. 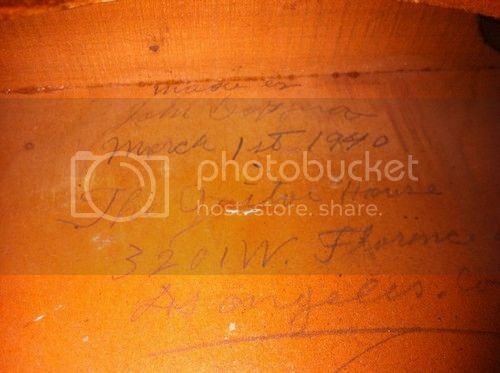 I pulled the resonator long ago and inside, scrawled in pencil it says "made by John Dopyera, March 1, 1940, The Guitar House, 3201 W. Florence Ave., Los Angeles, Ca.". Indeed! 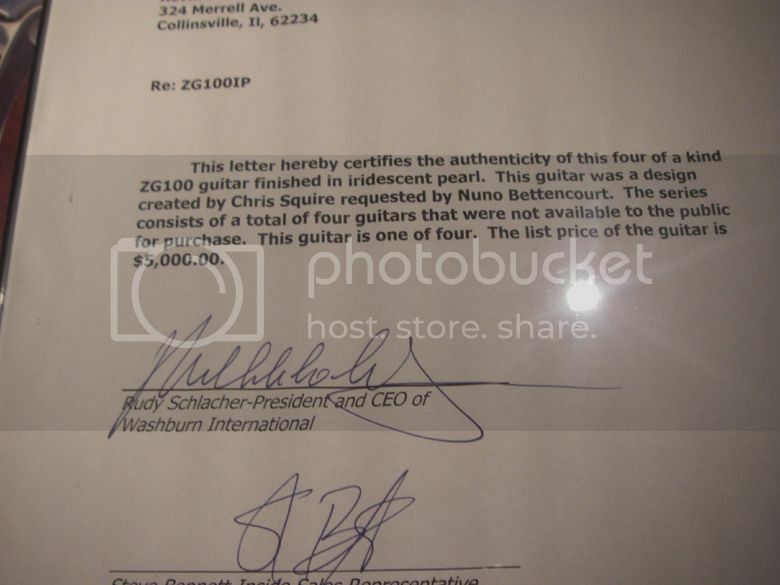 The guitar is currently listed on eBay with a Buy It Now price of $5,000. That's a lot of money but you can't argue with his logic. 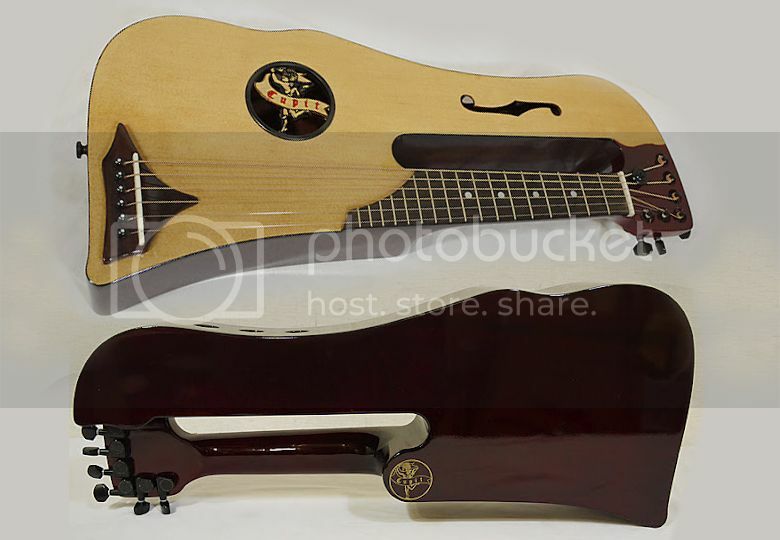 This is a rare, possibly unique, guitar and an important part of the history of the guitar - and the resonator guitar in particular. It really is a museum piece. Hamilton Custom Guitar made for Raymond ... does anyone know anything about this guitar? When I first saw the photos of this Hamilton Custom guitar, I thought it was yet another obscure 1960s Japanese-made creation, but upon looking closer I have revised this opinion and I expect that it's probably a handmade American instrument. As to how prolific - or even professional - a manufacturer Hamilton was I cannot say, but I expect it was a very small part-time operation (perhaps in the vein of Harvey Thomas). The script on the headstock is interesting. "Hamilton Guitars" looks as it could be a transfer-applied logo, but surely "Made for" and "Raymond" have been painted on by hand with the latter emulating the font used in the logo (or maybe the whole thing has been hand-painted?). This hints heavily at the small operation I was talking about. Witness also the crude handmade bridge. I say crude, but note that the saddles are fully adjustable. 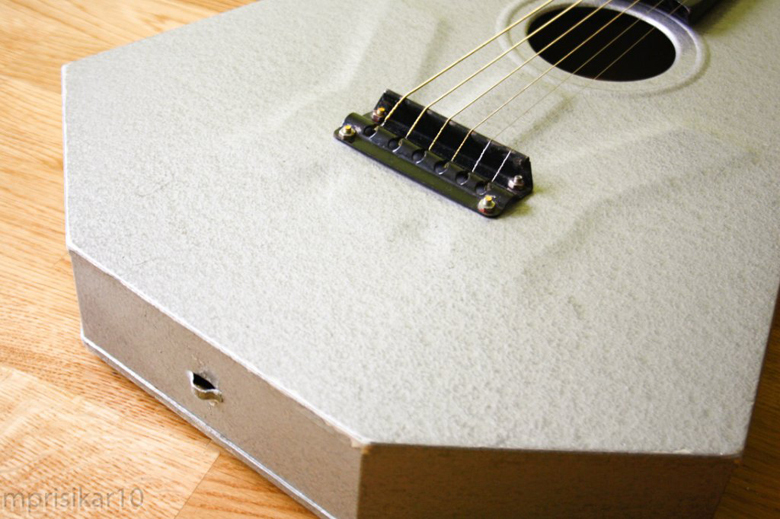 Other interesting features include a heavily radiused fingerboard which puts me in mind of my own Jolana Disco guitar. The seller knows little about this guitar saying that it was an estate find, and is currently listing it on eBay with a starting bid of $499.99. Labels: Hamilton Guitars, Luthiers, small company, vintage guitars, Weird guitars, What's that guitar? 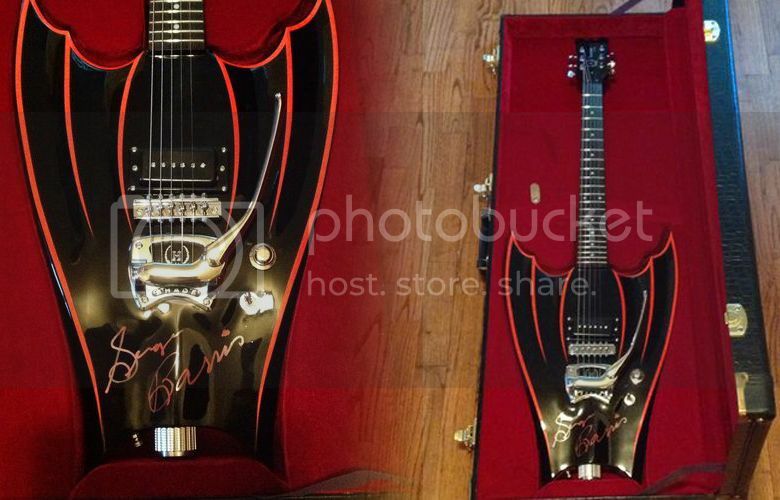 This guitar is designed and signed by George BARRIS only #100 made this is #56. It is designed like the Bat Mobile and is called the "Wing-Bat". George BARRIS was the original maker of the Bat Mobile. I won this very unique item at an auction. This is a very high quality guitar made by Hallmark Guitars. There is a red led light that works with a switch, very cool accessory. The black case is included with purchase. See picture #12, there is a small imperfection that happened during manufacturing. Currently listed on eBay with a starting bid of $1,699. Short-scale basses are not for everyone and certainly don't suit certain styles of modern music, but I'm quite fond of these "little thumpers". I don't know what it sounds like or how playable it is or how well it is set-up, but for me this 1960s Kent hollowbody shortscale model 743 bass is an absolutely gorgeous piece of guitar design. It's a Made in Japan masterpiece. 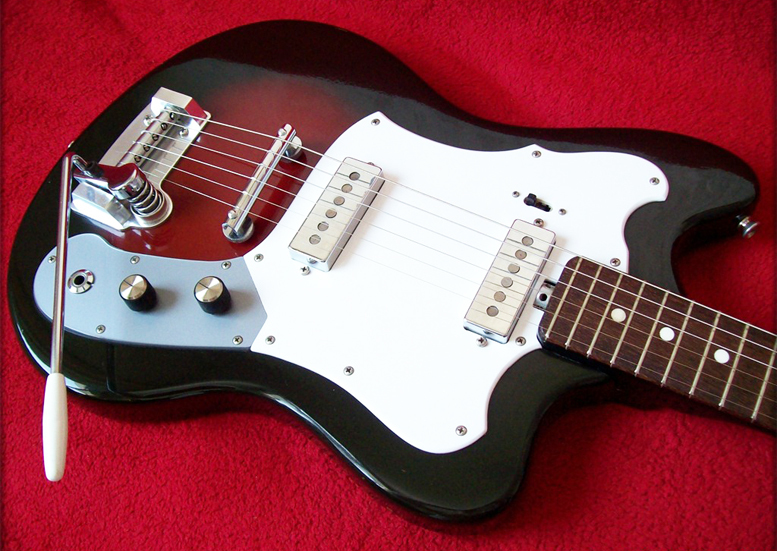 Check out that slanted neck pickup; of course the Japanese guitar industry was heavily influenced by Mosrite, the chosen guitars of their instrumental axe-wielding heroes, The Ventures. Witness also the triple binding around the sides of the instrument. Also, the tortoiseshell binding inside the f-holes and around the fingerboard. You get the impression that this was a real luxury edition. Currently listed for sale on eBay with a Buy It Now price of $849. The new Super-Sonic now has the Fender logo on its upside-down head rather than the Squier logo, but of course the irony is that the Squier version would have been Made in Japan rather than in Mexico, which is where I believe the Pawn Shop Fenders are now being produced, and of course as every level-headed Fender fan should know by now the Japanese-built Fenders really are the dog's what-nots. Nevertheless, it's nice to see it back; it's one of the Fender designs that I really enjoyed and of course is based on a flipped Jazzmaster/Jaguar outline. It's like a left-handed guitar built for the right-handed. Although, having said that I recall seeing Gruff Rhys from Super Furry Animals playing one several years ago, and he always plays left-handed but tends to use right-handed guitars because he keeps the stringing the same as for a righty. The Pawn Shop series from Fender supposedly "mashes up" old Fender designs, although the only differences I can see with the new Super-Sonic are that BOTH pickups are angled rather than just the bridge unit and that it comes in a nicer range of finishes. 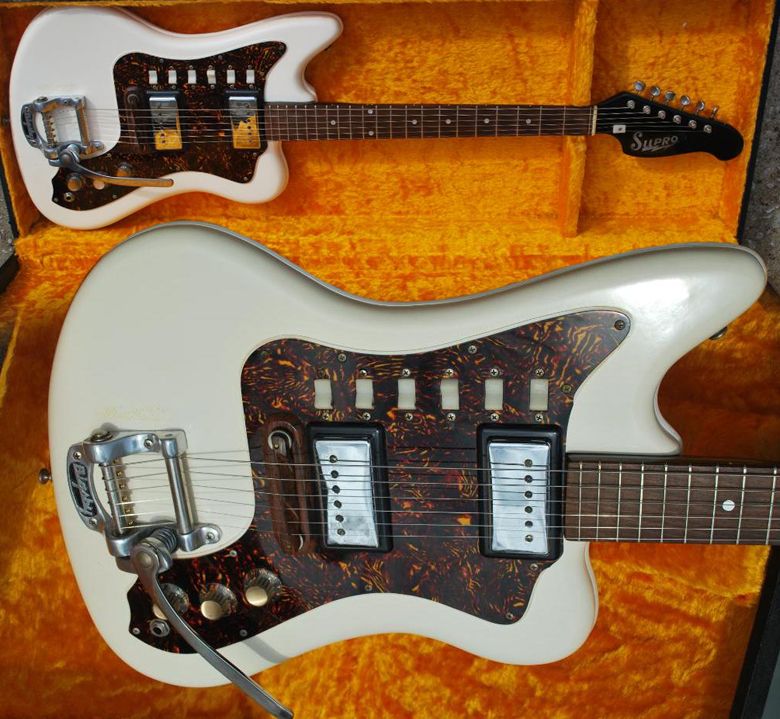 SCOTTSDALE, Ariz. (January 10, 2013) — The Pawn Shop Series introduces yet another pleasingly unconventional assortment of "guitars that never were but should have been," in which new models take the stage and long-vanished classics return in modern form. Fender is excited to welcome four new, out-of-the-ordinary models to its innovative and popular Pawn Shop series–the Pawn Shop ’70s Strat® Deluxe, Pawn Shop Super-Sonic™, Pawn Shop Mustang® Bass and Pawn Shop Bass VI. The Pawn Shop ’70s Strat Deluxe is one of the most unusual takes ever on the world’s most archetypal electric guitar, with a pronounced 1970s style and vibe. For tonal versatility, its alder body houses a Telecaster® single-coil neck pickup and an Enforcer™ humbucking bridge pickup with a smaller Wide Range chrome cover. 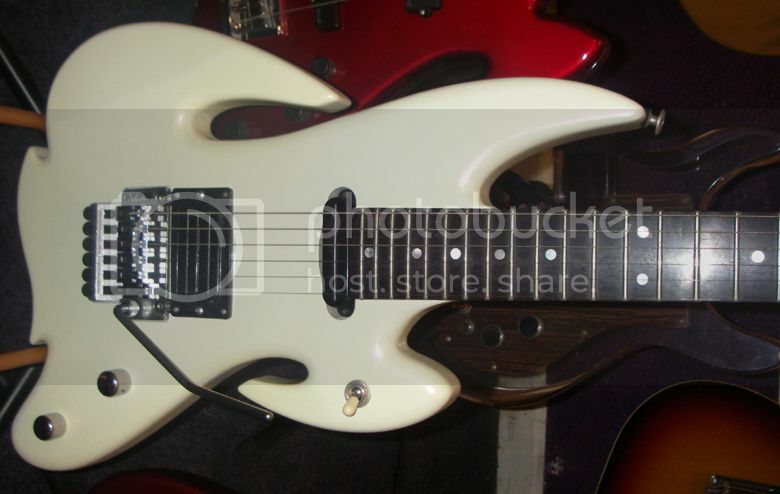 Other distinctive features include a "U"-shaped maple neck with 22 medium jumbo frets, 9.5" radius and "bullet" truss rod; four-ply white pearloid pickguard; three-way blade pickup switching and two Jazz Bass® control knobs (master volume, master tone); ’70s-style hard-tail Stratocaster® bridge and vintage-style "F" tuners. Available in 2-Color Sunburst, Black and Vintage White. The Pawn Shop Super-Sonic model resurrects an unusual, short-lived and increasingly collectible ancestor of the late 1990s, the Squier® Vista Series Super-Sonic guitar. 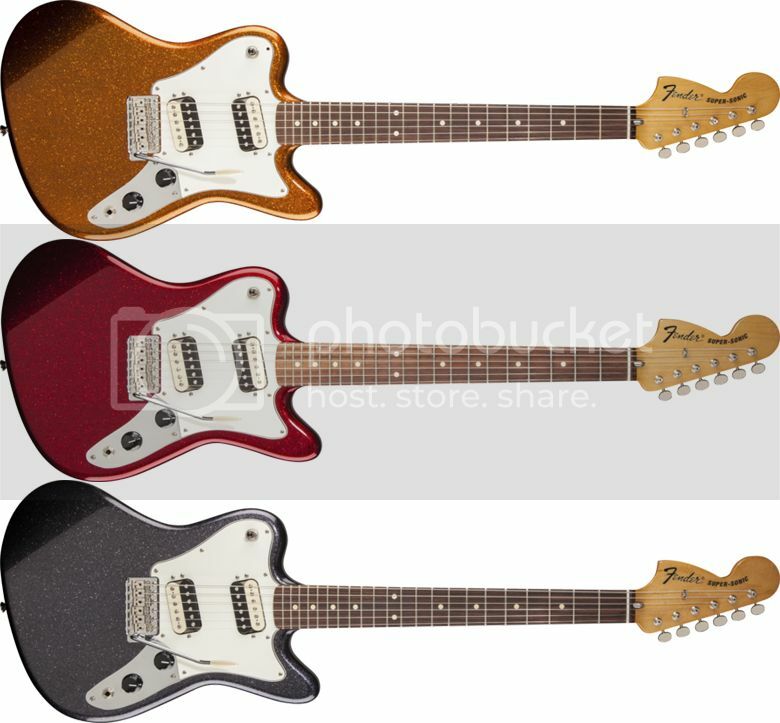 Very little about the Pawn Shop Super-Sonic isn’t highly distinctive—from its diminutive offset "reverse" body (resembling an upside-down Jazzmaster® or Jaguar®) and upside-down headstock to its short scale (24") and dual canted Atomic™ humbucking pickups (only the bridge pickup was canted on the original Squier models). Then there are the controls--neck pickup volume and bridge pickup volume only (no tone control), which are reverse-wired like the Squier original, meaning that the bridge pickup volume is the one closest to the bridge and the neck pickup volume is the one farthest from it. Other features include a "C"-shaped maple neck with "bullet"-style truss rod, 9.5"-radius rosewood fingerboard with 22 medium jumbo frets, three-way toggle pickup switching and dual Jazz Bass control knobs, three-ply parchment pickguard, vintage-style synchronized tremolo bridge, vintage-style tuners and new Super-Sonic four-bolt neck plate. Available in Apple Red Flake, Dark Gun Metal Flake and Sunfire Orange Flake. It's nice also to see a non-Custom Shop reissue of the Bass VI at last, although it's a shame that the individual pickup on/off switches and strangle switch have been replaced by a bog-standard Strat-like 5-position selector. 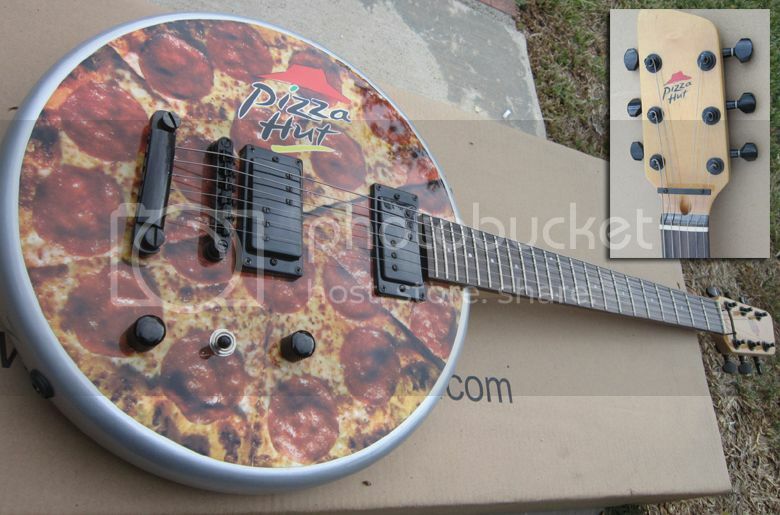 Other than to say that the base colour for the back and sides of the body would have been better if it was more "doughy" or at least yellow, is there really anything I need to say about this promotional Pizza Hut guitar? Currently listed on eBay with a Buy It Now price of $249. What a shame there isn't a vegetarian option. I have to admit that this is one of the coolest guitars I've ever seen: a variable geometry travel guitar by French luthier Sébastien Gavet called the Tour Bus Guitar (discovered on fellow guitar blog Guitar Wink). You just have to have a look at it to understand what it's about: folded, it takes as little space as possible, elegantly unfolded it provides leg- and arm-rests, plus a perfect look with the right amounts of futuristic ergonomic and steam punk feel. The hand carved mahogany is sumptuous and everything is at the right place (I love the control plate - people who follow my own guitar design blog know how much I've been busy with similar things, without ever reaching this level - that comes only with actual construction). And you know what? Its price is absolutely reasonable, it ranges from 1 100 € to 1 500 € - there are 3 models, including one with a Floyd Rose trem -, so I can even dream of buying one one day, and I will! The Kawai Moonsault (we've looked at examples previously here and here) is one of my favourite guitar designs, partly because it just looks so impractical but also because it demonstrates beautifully the wackiness of the Japanese when it comes to guitars. These guitars were created for the Japanese home market and are rarely seen in the West as it is, but here we have the extremely rare Crystal Moon version which features a clear acrylic body. Unlike the top of the range Moonsaults, which can be likened to Gibson's Les Paul in terms of construction and quality of build, the Crystal Moon utilises a bolt-on neck. It also lacks the body binding of its siblings, but does have the same "Phase of the Moon" fretboard inlays. This particular example is currently located in Germany and has an eBay starting price of £1,999. Although it bears the logo of string manufacturer RotoSound, this guitar is the product of legendary British luthiers John Birch. The pickups are interchangeable and can be changed from the rear of the guitar. The eBay listing tells how the whole interchangeable pickup concept came from Black Sabbath's Tony Iommi. One of the things I like about this guitar is its symmetry. You could flip it over for a left-handed player and the layout would be exactly the same. It even has output jacks on both sides of the guitar. This guitar is currently listed on eBay with bidding currently at $510 at the time of writing. Here's another intriguing one-off from Ergo Instruments, who normally specialise in upright electric basses (we've previously looked at a couple of their guitars based on Prince's Cloud design). 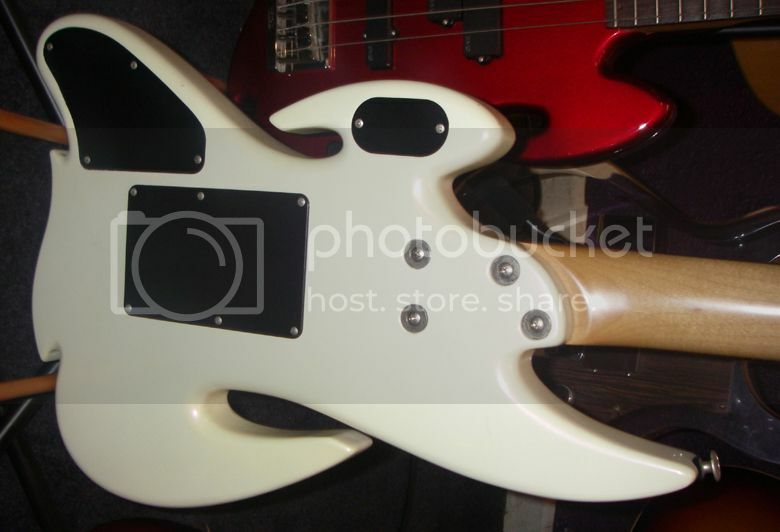 It's a doubleneck bass guitar with fretted and fretless necks. Also, the fretless neck is strung as an 8-string bass (i.e. four doubled courses with octave strings), which surprised me as I would have expected the fretted neck to be the 8-stringer. The necks are of hard maple/figured bubinga, and the body is 3-piece hard maple, thinner than usual so as to keep the weight down. Pickups are P-bass units by Dragonfire. Currently listed on eBay with a stating bid of £999. 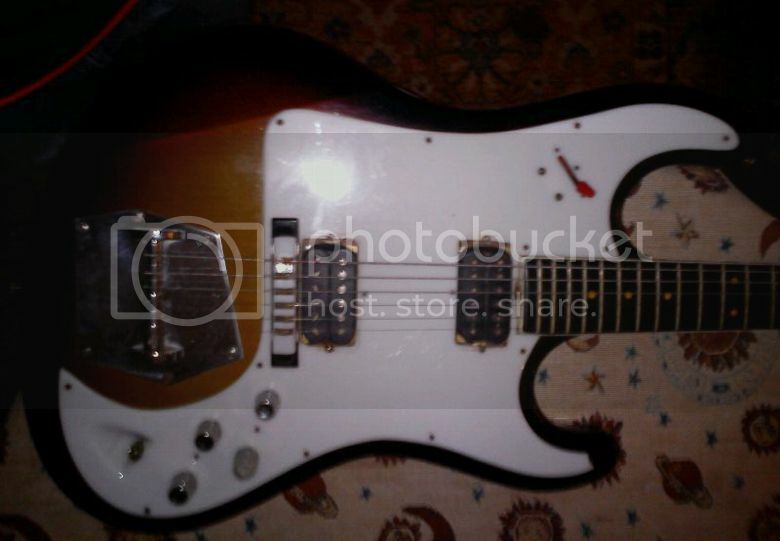 Another "Unknown" guitar needs identifying - Any ideas out there? I only have this bad quality photos, but I think they'll do the trick. 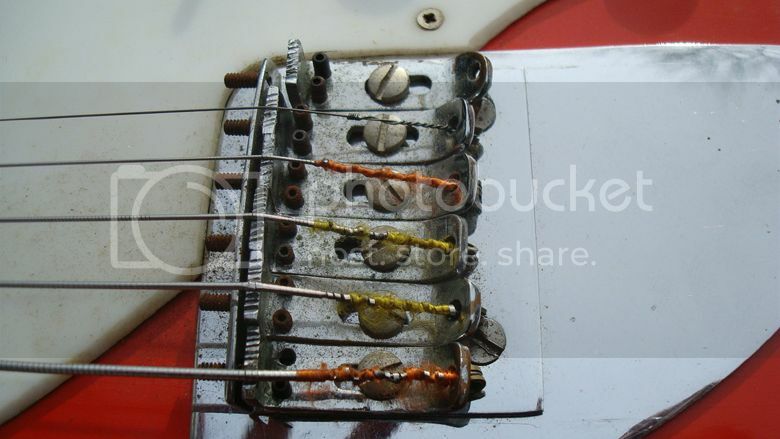 The pickups were replaced because of malfunction. Hi Adrián, the first thing I thought when I saw the photos is that the pickups had been swapped for something more modern. 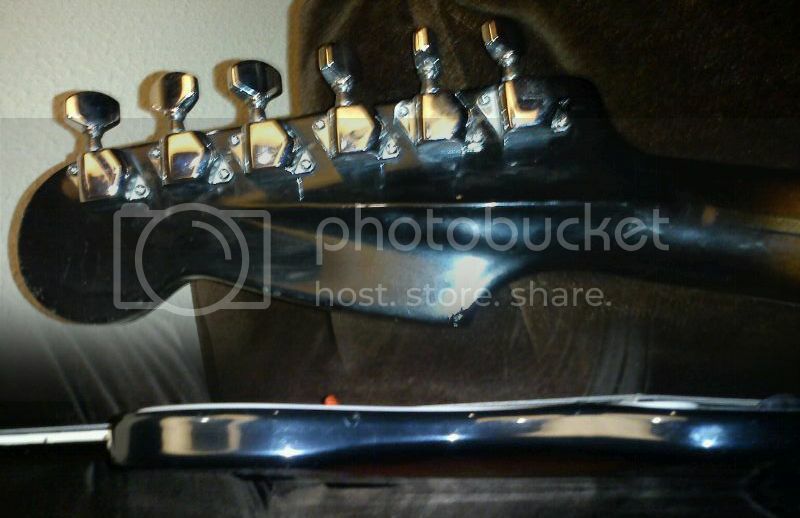 It also looks like the tuners have been replaced and possibly other hardware too(?). 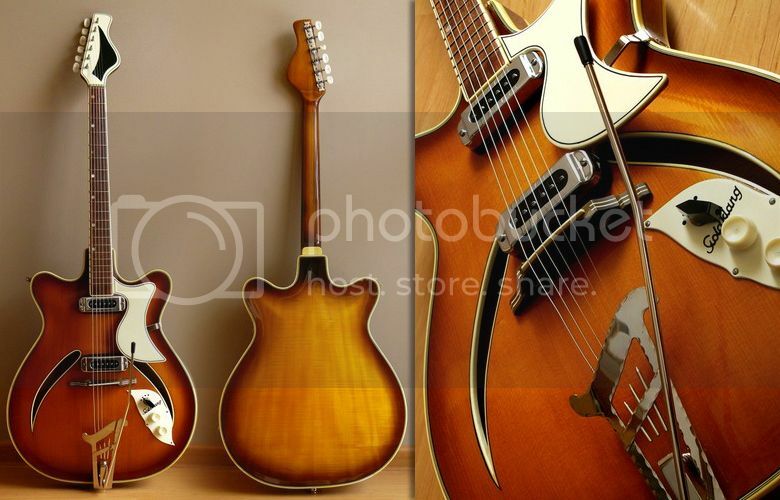 I fear that I can offer little assistance other than to say that the shape of body and headstock are reminiscent of certain 1960s Hofner guitars. 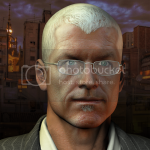 Perhaps our readers might have a more concrete identification for you? The Swedish pop group ABBA won the 1974 Eurovision Song Contest, held in Brighton, UK, with the song "Waterloo". For the contest and for subsequent TV appearances and public appearances around the world, Abba member Björn Ulvaeus played a multi-pointed star-shaped guitar created by Goran Malmberg. Unfortunately, the orignal guitar is now missing, but Malmberg has created this replica for the ABBA Museum in Stockholm. I don't care about ABBA's "pop" credentials, or the (im)practicalities of such a very pointy guitar design, this is one of my favourite iconic guitar designs and along with the John Birch Superyob as played by Slade's Dave Hill it epitomises the whole glam rock era. I designed the entire guitar shape. The original question from Bjorn was that they liked a guitar in the shape of a star, and I made a few baseline drawings for him to look at. If you look at the shape it is not symmetrical. 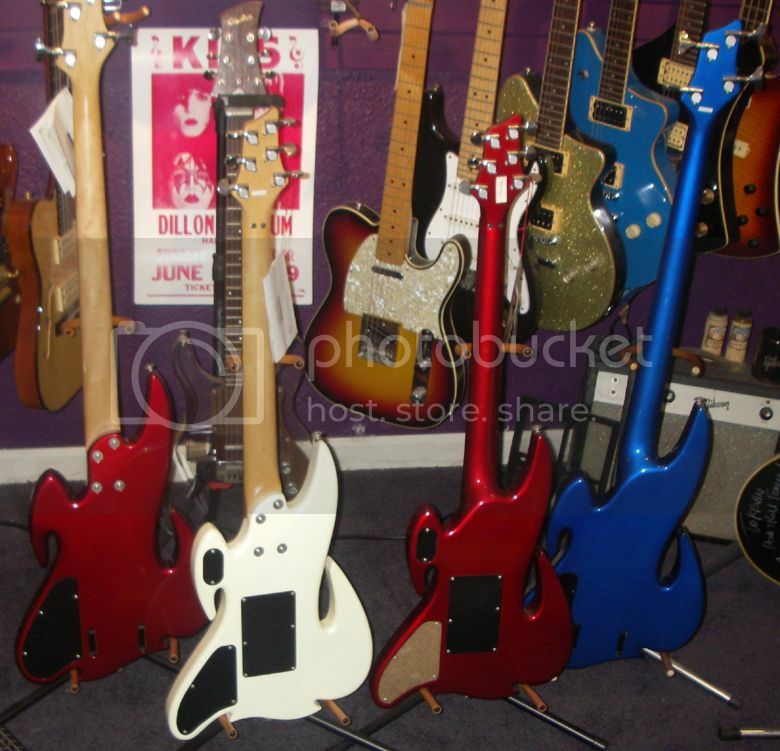 We have the Gibson guitar "Flying V" and "Explorer" from the time that has "horns" in different directions. A common thing with those guitars along with my star guitar is that it has to serve a practical purpose, therefore the horns are pointing logical directions. The strap has to be fastened in a good balance position. There should be no horn where one has its right arm. There has to be a horn to place tone and volume knobs. So the design issue was to find a design balance that included those features. I have seen copies of the guitar. No criticism, but if the builder does not has a very good picture to make a copy from, he will surely miss the geometric figures behind the design. And the guitar will not show the same harmony as the original. About the "player" issue, it is just about the same as a Strat with patent number pickups. The body is laminate plywood, for the reason that the edge of the horns should not break. It is all solid as a Strat. Good sustain. 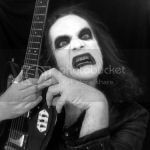 However, the guitar main purpose was for image, and even if Bjorn had come "asking" for it as an instrument, there was newer any time for fine tune adjustments. For more see this post. Speaking of calendars, unfortunately - as some of you may have realised by now - we weren't able to put together a calendar for 2013. I'm sorry, and despite the offer of assistance from one enthusiastic Guitarz reader, I just haven't had the time over the last few months to get my arse into gear and even get the ball rolling in this department. Thanks also to Bertram and David who have been posting solidly these last few weeks whilst I've been out working anti-social hours. So what have we lined up for 2013? Well, to be honest, I don't know for sure yet, but you can expect even more of the same, i.e. 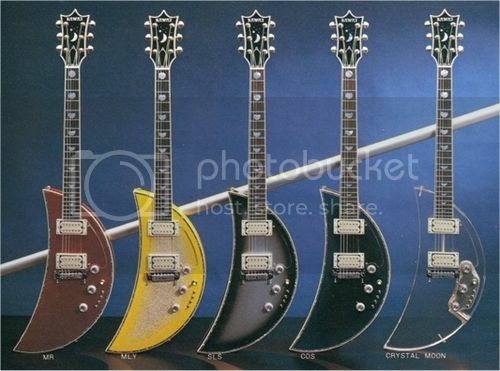 weird and wonderful guitars! We also enjoy seeing your guitars, so if you have any that are that little bit different from the same old guitars we see everywhere else, please get in touch!